"Thanks again for the prompt service. Our staff are very appreciative." If you are looking for an affordable, reliable and simple biometrics time attendance clock, the TA500 is your ultimate choice. It can store 2000 fingerprint templates and 80,000 transaction logs in its flash memory at any given time. Equipped with the most commonly used ethernet network connection and USB flash disk, the TA500 is the most powerful, yet simple to use attendance system for your small and medium office. The TA500 is easy to operate - connect it to the power source and it's ready to roll! It comes with an in-built battery to keep it operational during a power failure. Ethernet network connection and USB Flash disk are available for your choice of connectivity. 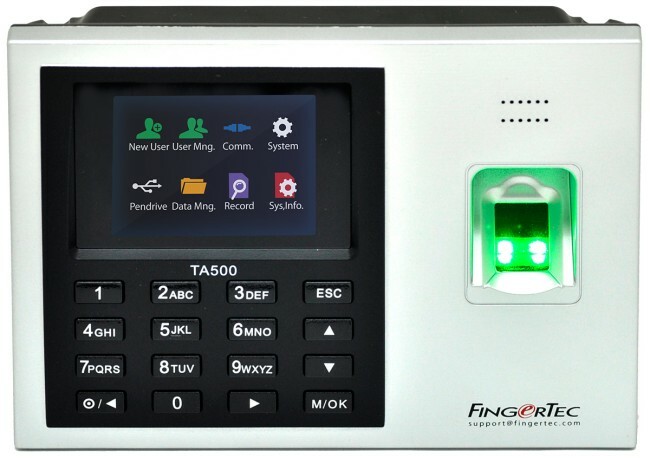 The TA500 gives you a variety of verification options such as fingerprint, password (PIN) or a combination of both, providing the security and versatility you need. The TA500 was designed to offer an economical biometric solution, giving you efficiency and performance without burning a hole in your pocket. Equipped with a colour LCD screen and intuitive icons, navigation in the TA500 is simple. Made from robust materials, the TA500 can withstand wear and tear for years to come and it comes with 3 years limited warranty. The compact TA500 can store up to 2,000 fingerprints and 80,000 transaction logs, more than sufficient for your office requirements. TCMS V3 is loaded with useful features and various reports are available for your business. Fingertec TCMS V3 remote software quick start training via telephone and Teamviewer is a single session overview of the software. 12 month unlimited Australian support agreement.